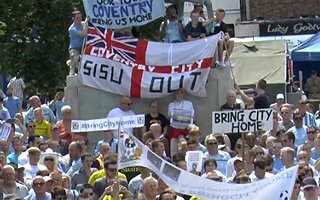 Saturday’s afternoon saw several thousand people gather in central Coventry to express their anger at SISU, club owners who relocated Coventry City to Northampton. An online petition with almost 20,000 signatures pressures authorities to take action. Fans of English side Coventry City FC showed on Saturday where they believe their club belongs. Broadgate, the central square of Coventry, saw at least a few thousand people turn up to demonstrate against the club’s relocation to Northampton, roughly 35 miles away. The numbers on Saturday were much greater than those at CCFC’s fixtures played at the Northampton Sixfields Stadium. Since the move, The Sky Blues lost 77% of their fanbase from Ricoh Arena and average at just over 2,500 people per game. Perhaps the most exciting part of the demonstration was this emotional statement by Moz Baker of the Sky Blue Trust, stopped numerous times by chants from the crowd. Baker’s speech presented arguments which were well known to those in attendance, as they are well documented by local and national media. “So I say to our owners: pay the many that you’re due, £590,000 – that’s the money you owe to the Football League and to the ACL – and a deal can be struck. And drop the appeal. You lost the appeal. Lord Justice Hickinbottom didn’t just reject it, he kicked it and trampled all over it. Even Brazil were closer to victory”. The last statement of course referred to both Brazil’s 1-7 loss to Germany and the recent smashing criticism SISU received from Lord Justice Hickinbottom in his judicial review demanded by the CCFC owners.